So I’ve been mentioning that I have a contest coming up. I’ve also mentioned that it will involve using a camera. “What is it?” some of you have asked. Here are some details. There will be two winners, first and second place. 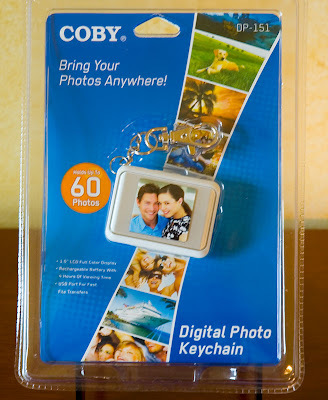 A digital photo keychain that holds up to 60 pictures. It includes a USB cable, a rechargeable lithium-ion battery and file transfer software that works with Macintosh OS X and Windows 2000 or newer operating systems. 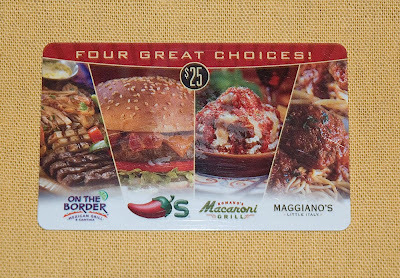 A twenty five dollar gift card good at any of these restaurants: On The Border, Chili’s, Macaroni Grill or Maggiano’s. 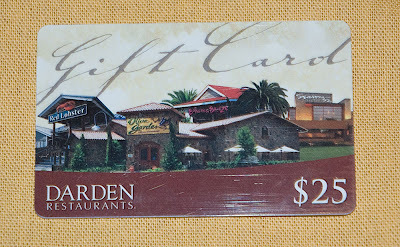 A twenty five dollar gift card good at any of these restaurants: Red Lobster, Olive Garden, Bahama Breeze or Seasons 52 Fresh Grill. The contest will be posted tomorrow, Friday February 6th, at 6:00 p.m. CST. There will be no deadline. If it takes one day or one month to get two winners, that’s fine. I can wait. What is the contest you may be wondering…It is a photo scavenger hunt. I will list two categories of photos I’m looking for and you will need to submit, via email, a minimum of three from each. I’m not looking for quality per se, just the required subject. As long as you have a digital camera with the ability to email your pictures to me you can play…and I hope you all will. Note: All of your photos need to be submitted in one email, and please reduce the size first. Questions: Reduce the size to what? If we're on a photo sharing site (like flickr) are links to pics sufficient? Do you have a specified format (i.e. jpg vs gif)? Reduce the size so it’s not huge, if possible. If you can’t, that’s okay. I would prefer that the photos be emailed, but if you provide a direct link to the pictures so I can copy and paste them, its okay; but provide all of the links in one email. I would like them as a jpg, preferably saved for web, it keeps the file size down. OH I am SO excited about this and I am putting my game face on!!! Sounds like a nifty challenge. I'll be looking forward to reading your next post! A scavenger hunt? Awesome! Looking forward to hearing more about it. I hope what I have to hunt for is buried under all the snow we have in Vermont. As long as this isn't one of those - take a picture of yourself naked - things - I'm in. Because trust me - you don't wanna see fatboy naked. Since I do not actually own a digital camera (mine broke and I haven't replaced it) can I use my camera phone? I don't know how to resize photos but the ones on my phone are teeny tiny. I can email them though. This is a cool contest. Why do I have the feeling that you would secretly enjoy that type of contest so you could see the women's photos?!? You can use your camera phone as long as you have the ability to email me the pictures and I can tell what they are. Don't worry about resizing them. Wheeee a photo scavenger hunt? Yay. I need some serious distraction these days.